Alice Culpepper, 2, F, GA.
E-mail written Dec 2014 - Feb 2015 to Lew Griffin from Susan Webster Thompkins, Phone 706-888-0866, e-mail address. Survived by wife; son, M.V. Culpepper; daughters, Mrs. M.L. Porter, Mrs. E. L. Ramsey, Mrs. N.E. Wynn, Mrs. Rocy Wynn, Mrs. Lucy Porter, Miss Mary Culpepper, and Miss Emma Culpepper. Obituary of Mrs. Martha C. Ford, Columbus Enquirer-Sun, Friday Morning, Dec. 7, 1951. Find A Grave Memorial# 16521950. Find A Grave Memorial# 16521971. Sarah Culpepper, 25, F, GA.
Sarah J. Culpepper, 29 Feb 1845 - 15 Oct 1921. E-mail written 1998-2012 to Lew Griffin & Warren Culpepper from John Mallory Land, Columbus, GA, e-mail address (Feb 2012). Confederate Pension Application; (n.p. : n.pub.). A. U. Culpepper, Son, Wh, M, Apr 1896, 4, sng, AL/GA/GA. Find A Grave Memorial# 78675179. Virgil D. White, compiler, Index to Georgia Civil War Confederate Pension Files, Waynesboro, TN: The National Historical Publishing Company, 1996. James R. Gaston, Grandson, M, 1 2/12, Sng, GA/GA/AL. James R. Gaston, Grandson, M, 10, Sing, GA/GA/GA. Sarah J. Culpeper, d. 15 Oct 1921 in Muscogee Co., GA, 26400-C.
Obituary of Sarah Jane Morgan Culpepper (#1657), published Monday, 17 Oct 1921, p.2. There is a very old bridge in Phenix City named after Martin Van Buren Culpepper. It is called 'Culpepper's Bridge'. Find A Grave Memorial# 14420183. Ola Culpepper, Dau, Wh, F, Jan 1898, 1, sng, AL/GA/GA. Muscogee County Court of the Ordinary (Books F-U transcribed by Lew Griffin), compiler, Muscogee Co., GA Marriages, 1868-1920 (Transcribed by Lew Griffin), Salt Lake City, UT: Genealogical Society of Utah, 1965, Repository: LDS Family History Library - Salt Lake City, Call No. Film# 401845, 401858-859. 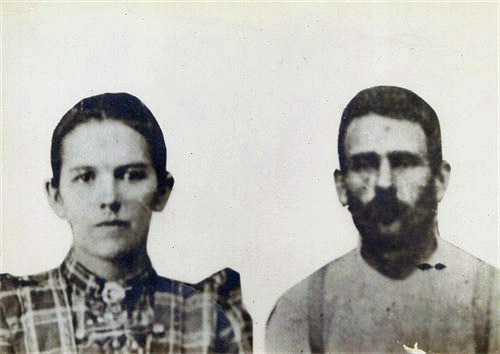 Martin V. Culpepper and Triny Roberts on 18 Jan 1890 in Muscogee Co., GA, Bk K-4. ED 185, sheet 21, line 27. George Culpepper, 6/12, M, GA.
Manie W. W. Culpepper, 9 Jan 1894 - 19 Feb 1960, Wife of William Stephen Culpepper, Interred 23 Feb 1960 in Arlington National Cemetery, Section 8, Site 618 LH. Arizona Vital Statistics Online, Arizona Department of Health Services, Phoenix. Died: 4 Jan 1917 at age 27 in Nogales, Santa Cruz Co., AZ from acute cardiac failure. Informant: Capt. J. T. Tarsus, Co. "C" 2nd Alabama. George Lee Culpepper, 502 Chesnut, Anniston, Calhoun Co., AL, age 25, born 3 Nov 1891 in Macon Co., AL, Steel maker at Anniston Steel Co., Anniston, Alabama, Single, Caucasian, Has a mother and sister to support, Tall Height, Slender Build, Brown Eyes, Brown Hair, Not bald, No disabilities, Registered 5 Jun 1917 at Calhoun Co., AL. George Lee Culpepper, White, born 3 Nov 1891 in Macon, Alabama, residing in Norfolk, Virginia, registered 27 Apr 1942. George Culpepper, Son, Wh, M, Nov 1891, 8, sng, AL/GA/GA, At school. E-mail written 2004-2007 to Lew Griffin & Warren Culpepper from Colleen Andrews Morris, Dripping Springs, TX, e-mail address. E-mail written 1999 to Lew Griffin from Jim Adams. Jethro L Culpepper to marry Lucretia Joyner, Bond Date: 20 Dec 1865 in Nash Co., NC, Record No. 01035, Bondsman: John Culpepper, Witness: B H Sorsby, Bond No. 00008565. Mary Adams, 66, F, Wh, At home, NC. Charles D Culpepper, M, 25 Apr 1893, Unknown, 13 Mar 1962, 68Yrs, Maiden-Unk,. Charles David Culpepper, Mulga, Jefferson Co., Alabama, age 24, born 25 Apr 1893 in South Pittsburg, Marion Co., Tennessee, Employed as a Coal Miner by the Tennessee Coal, Iron and Railroad Company, Bayview, Jefferson Co., Alabama; Married with no children; Caucasian; No prior military service; Claims exemption from service to support family; Medium height, Slender build, Brown eyes, Brown hair, Not bald, No disabilities. Registered 5 Jun 1917 at Jefferson Co., Alabama. E-mail written Feb 2008 to Warren Culpepper from Stephanie Gifford, e-mail address. E-mail written 2007-2012 to Warren Culpepper from Deana Tredinnick (gd of #38037), Herndon, VA 20171, e-mail address (Feb 2012). Ruth Smith Williams, Early Marriages of Nash Co., NC, J.W. Watson, 1968. Madison Culpepper to marry Catharine Upchurch, Bond Date: 18 Jan 1847 in Nash Co., NC, Record No. 01035, Bondsman: Thomas Dean, Bond No. 000085660. Bolivar Culpepper, 2, M, Wh, NC. Dianna M. Culpepper, 3/12, M, Wh, NC. J. M. Culpepper enlisted 25 Mar 1863 as a Private at Franklin Co., NC; resided in Franklin Co., NC; served in B Co. 13th Battn Reg. NC and B Co. 66th Inf Reg. NC. Issinone Culpepper, 3, F, Wh, At home, NC. Spencer Melton, Other, M, sng, Black, 17, Servant, NC/NC/NC. Jasper Griffin, __, M, Wh, May 1878, 22, sng, NC/NC/NC. Katherin E Culpepper, White, born 1826, died 1 Oct 1916 in Franklin Co., NC. James Henry Culpepper, Mapleville RFD#1, Franklin Co., NC; age 39, born 9 Nov 1876, Caucasian, Unemployed; Nearest relative is his mother, Mrs. Nannie T. Sykes of Mapleville RFD#1, Franklin Co., NC; Medium height, slender build, brown eyes, black hair, not bald. Has slight paralysis, kidney and bladder trouble causing feet and legs to swell, can't wear shoes, rheumatism. Registered in 12 Sep 1918 in Franklin Co., NC. Olinda Harris, Other, F, sng, Mulatto, 21, Cook, NC/NC/NC. Dwight Lyman Culpepper, Spring Hope, Nash Co., NC; age 34, born 7 May 1884, White, Employed in tobacco business by L. C. Morris & Sons of Spring Hope, Nash Co., NC; Nearest relative is Sallie Culpepper of Spring Hope, Nash Co., NC; Medium height, medium build, gray eyes, black hair and no disabilities; Registered 12 Sep 1918 in Nashville, Nash Co., NC. North Carolina State Board of Health - Bureau of Vital Statistics, compiler, North Carolina Death Certificates, 1909-1975, Online database at Ancestry.com, 2007. Residence: Zebulon, Wake, North Carolina. Zollie Nicholson Culpepper, age 30, resides in Mapleville, NC; born 3 Sep 1886 in Nashville, (Nash Co.), NC; Farmer for self, Mother dependent upon him for support, Single, Caucasian, short height, slender build, brown eyes, black hair, not bald and no disabilities. Registered 5 Jun 1917 in Franklin Co., NC. 2. Alice Pearl Wood, b Mar 1877, d bef 1920 in Franklin Co., NC. She married Charlie T. Wood, b 16 Apr 1868 in Franklin Co., NC (son of Thomas H. Wood and Mary Francis Gay), d 12 Aug 1948 in Franklin Co., NC, buried in Peach Tree Baptist Church Cemetery, Nash Co., NC. They had seven children born between 1901 and 1917: Martha, Sally, Mary, Annie Bell, Kathleen, Braxton and Virginia. 3. Ida F. Wood, b 28 Mar 1878 in Nash Co., NC, d 6 Jan 1950 in Rocky Mount, Nash Co., NC. Married Mr. Griffin. 5. Bonny B. Wood, b 1886. He married Lula, b 1886, and they had seven children born between 1916 and 1928: Christine, Garland, Carl, Ila Mae, Douglas, Jim and Annie B.
E-mail written 4 Feb 2010 to Warren Culpepper from Bruce Woodard, Smithfield, NC, e-mail address. W. H. Culpepper, Self, M, sng, Wh, 22, Clerk Dry Goods Store, NC/NC/NC. At G. W. Lewis' by M. J. Willoughby, M. G., witnesses: J. M. Culpepper, G. William Lewis, J. A. Culpepper. Frank Douglas Culpepper, age 30, RFD#2, Spring Hope (Nash Co.), NC; born 11 Aug 1886 in Spring Hope, NC; Farmer, Single, Caucasian, Medium height, slender build, brown eyes, black hair, not bald and no disabilities. Registered in 5 Jun 1917 in Franklin Co., NC. She is buried in a family cemetary outside of Spring Hope, NC. Her gravestone shows her date of birth as 1865 and death in 1907. Annie Culpepper, Daughter, F, Wh, 25, sng, NC/NC/NC. William H. Culpepper, Father-in-law, M, Wh, 72, wid, NC/NC/NC, Not emp., Vet=N. William H Culpepper, White, born 1857, died 14 Dec 1935 in Franklin Co., NC. E-mail written July 2000 to Lew Griffin from Deborah Fern Coggins Gammon (Mrs. Barry Thomas Gammon), e-mail address.